Vintage and Rare Washburns / d-64 prototype? Big disappointment with the prototype. #1 it wasn't solid wood, #2 the neck was bowed and all the way from low e to high e on the 13th and 14th fret was dead frets/fretbuzz/. I will be returning this, sadly. really, that is pretty awful. I've never purchased from them I just looked for the best price for that instrument. And for don't tread on me, I agree that solid wood could be tricky with temperature/humidity, but from anywhere from $9-50 dollars you can get a guitar humidifier, but that's just me. Laminate is stable, and the sound does not change, very much agreed. oops, sorry, i removed the post. I keep my acoustics a full step down as well. But I also play a lot of Elliott Smith songs and need a capo for all different keys. Absolutely, thanks for the input. I was gonna plan on getting it checked out to make sure its solid wood, otherwise I'd be leaving some neg. feedback. As far as the finish, i'm not to concerned. My main concern is the sound and if I'm not happy with that, I'm going to go back to saving for the epiphone masterbilt ef-500m or ef-500r. 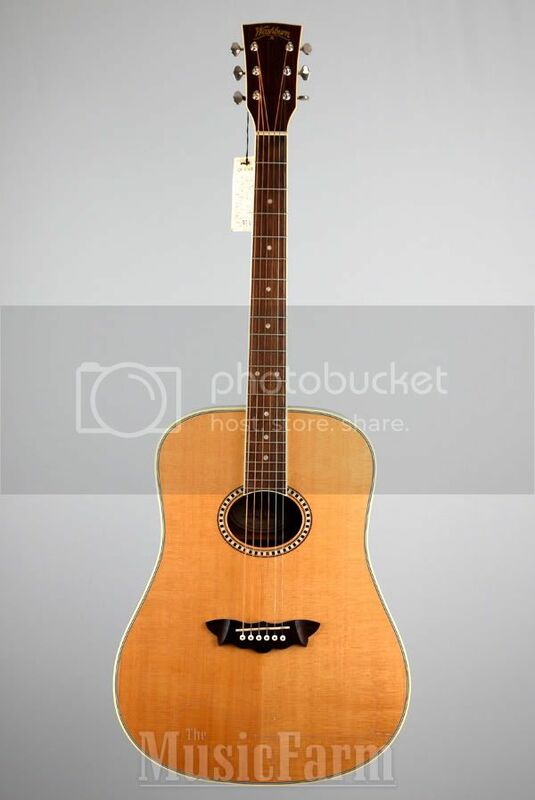 I found a solid wood Washburn D-64 prototype on eBay from a seller themusicfarm, who is an authorized Washburn/Dean dealer. Solid spruce top, solid mahogany back and sides ebony fingerboard, the buzz Feiten tuning system, bone nut and saddle, and Grover Sta-Tite tuners. I got it for 270 by auction. Luckily for me there wasnt too many bidders to try to buy me out. They had another one up there for 750 buy it now. Great deal for a solid wood guitar. apparently its a private collection and I can't find this prototype any where. I'm supposed to get it in the mail on tuesday or wednesday. I hope I have a good washburn experience. I loved my dads nuno n4 electric. Any one else come across one? I'm not too worried on taking the chance, they are an authorized dealer and a store. I'm excited to receive the guitar.